To celebrate this we are offering a FREE faecal worm count for every dental performed in April! If your horse has worms, we are also offering 10% off all Virbac wormers! Why offer egg counts with a dental? At KEC we believe that we need to have a ‘whole horse’ approach to the treatment and management of your horse. Not managing gastrointestinal worms in your horse can lead to gastric ulcers, weight loss, colic and poor hair coat. That being said, worming your horse with the wrong drug or when they don’t have worms can cause resistance to the drugs available. This has implications for the future of worm management for all livestock industries. A faecal egg count tells us how many worms are present and what type they are. We can then decide when to treat and with what drug. If you missed it - KEC held a client education evening on the 2nd of April at 7pm at Trackside, Kilmore. The evening was sponsored by Virbac, Ranvet and Pet Stock. We had lucky door prizes - half price dental, first aid kit and a $50 Pet Stock voucher. Dr Luke opened the night with a brief introduction to his involvement with KEC as owner, his other business Motion Equine Podiatry Consulting and introduced Tom Thurley from Virbac. Tom discussed the procedure around the collection of faecal egg counts and what information is provided so we can decide when to treat for worms and with what drug. Next Dr Olivia spoke on what is involved in a routine dental examination at KEC. She discussed the importance of the physical examination before the start of the dental exam and how, through the use of the correct equipment, a thorough examination of the mouth can be performed. It is difficult to see into the mouth at the best of times due to its elongated shape, therefore without a gag, a power light and picks and mirrors, it is very difficult to fully examine the mouth. To do this, the horse needs to be sedated. Veterinarians are qualified to carry and administer sedatives to your horse. To finish, Dr Georgie discussed the horses mouth, from foal to geriatric. Foals start with a total of 24 teeth as the molars have not developed yet. As the horse ages, it develops a total of 36-44 teeth. The reason for the range is some horses have wolf and canine teeth, whereas others don’t. 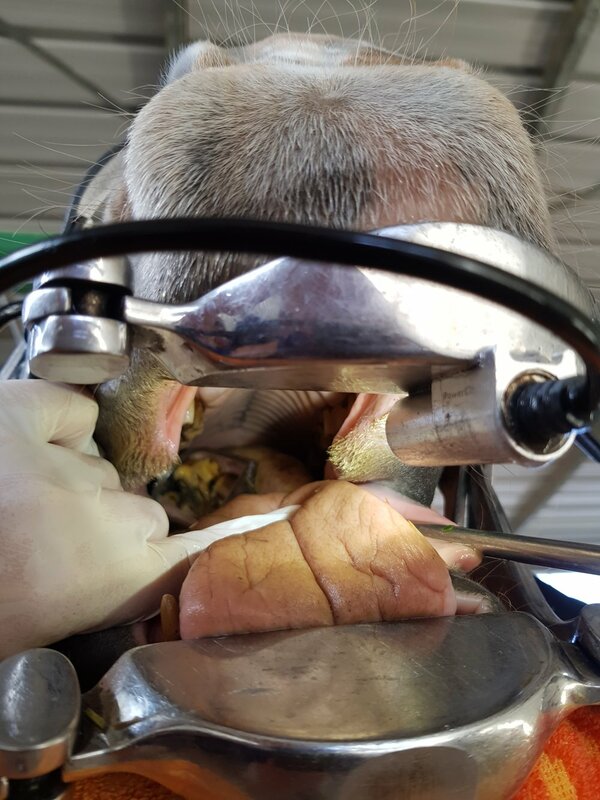 Georgie discussed that even examining a foals mouth is important to check for over or under shot jaws. She spoke about the importance of checking the ‘breakers’ mouth from 2-4 years of age. At this time, the teeth present as a foal are shedding (deciduous teeth). These can become retained and need to be removed. This is also an important time to check for and remove wolf teeth. Wolf teeth can cause pain when using a bit, therefore it is best to remove them. The earlier wolf teeth are removed, the easier the process. As the horse ages, the wolf teeth become larger and adherent to the surrounding bone. Finally, Dr Georgie spoke about the adult mouth, and how it works as a single grinding unit to process feed. In the adult mouth, the teeth continually grow. That means that the top and bottom teeth need to oppose each other. The top and bottom teeth will wear each other evenly. If a tooth is missing, the opposing tooth has nothing to wear it down and it grows into the gap below. This significantly changes the way the mouth functions. Our next education evening is scheduled for late in May. 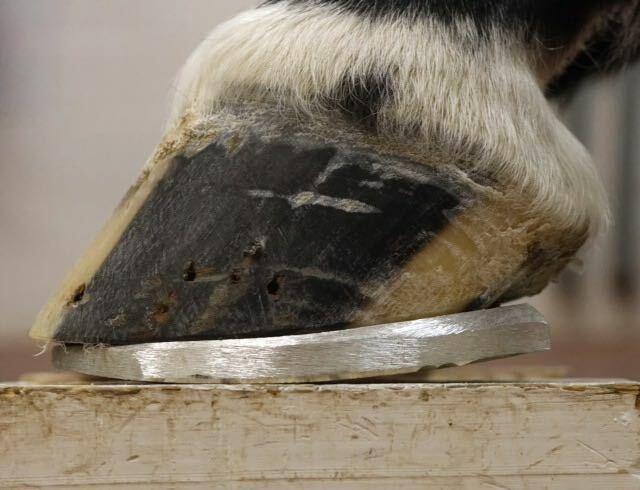 This will cover Hoof Care and Lameness Prevention. For more information, like us on Facebook or send us an email to admin@kilmoreequine.com.au and we will add you to our email list.